There are very few times that I eat in a restaurant and am bowled over by every single bite of food. Usually, there is some component of the meal that I think could use improvement. I can honestly say that our experience of lunch at Redd falls into the flawless category. Our lunch was not only tasty, but it was beautifully presented. 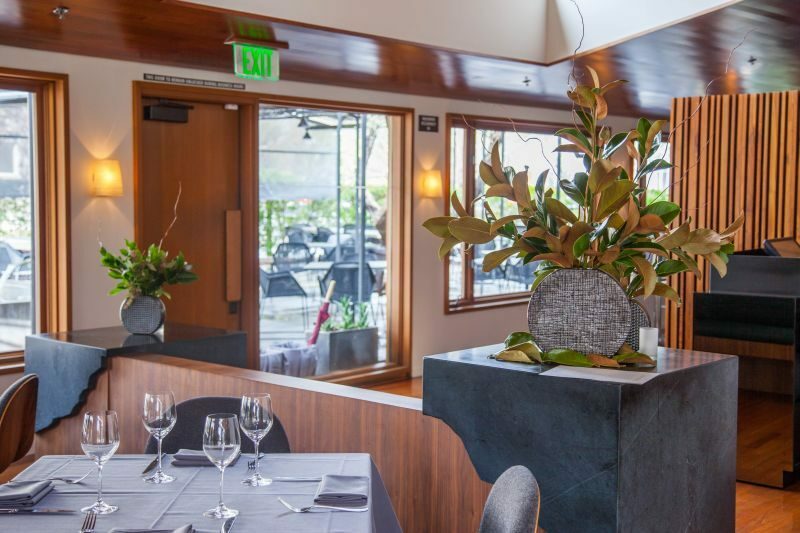 The food was interesting without being too fussy or overly complicated; the atmosphere was comfortable and the service was outstanding. 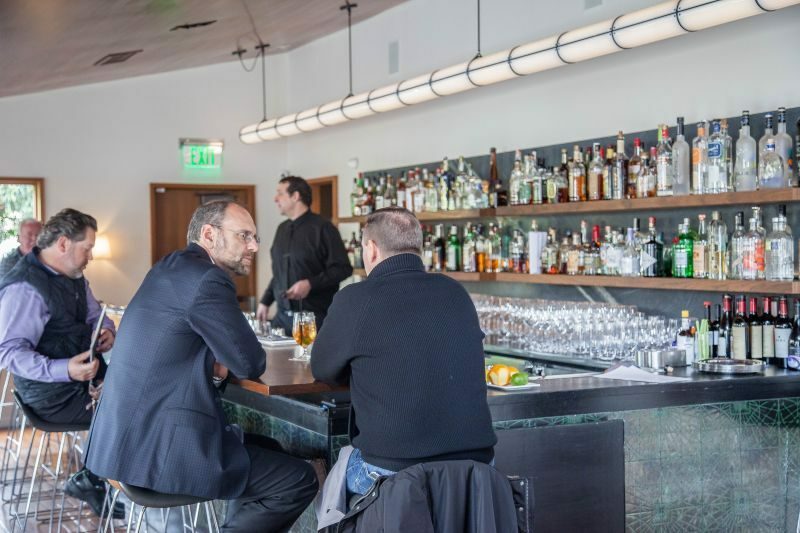 Redd’s decor is done with a contemporary flair. I loved the color scheme of the grays and teal shades which were grounded by natural wood flooring and accents. To me, it gave the impression of a modern art gallery; appropriate, as all the dishes were little works of art on our plates. On this occasion, we weren’t drinking wine as we had appointments at wineries after lunch and we always keep our alcohol consumption levels in mind. We both stuck to iced tea. 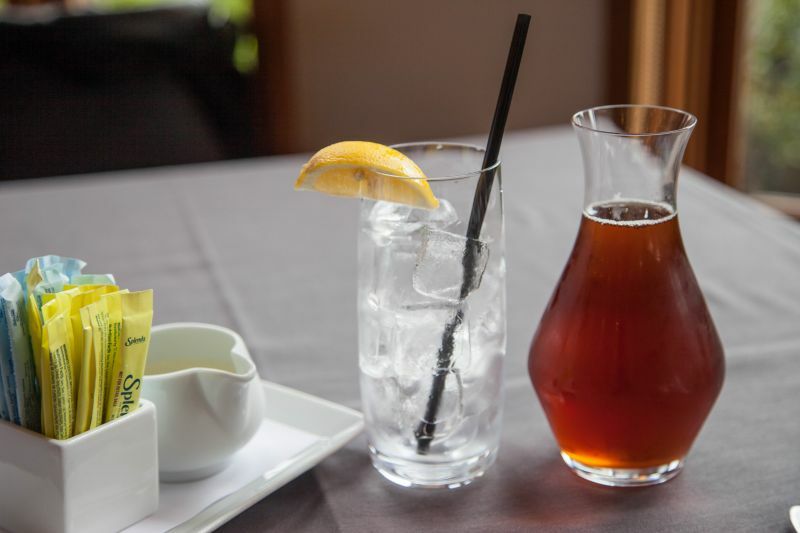 I loved the little carafes in which our tea was served. They even offered simple syrup for sweetening. Great touch. As it was lunchtime, we agreed to share an appetizer between us. 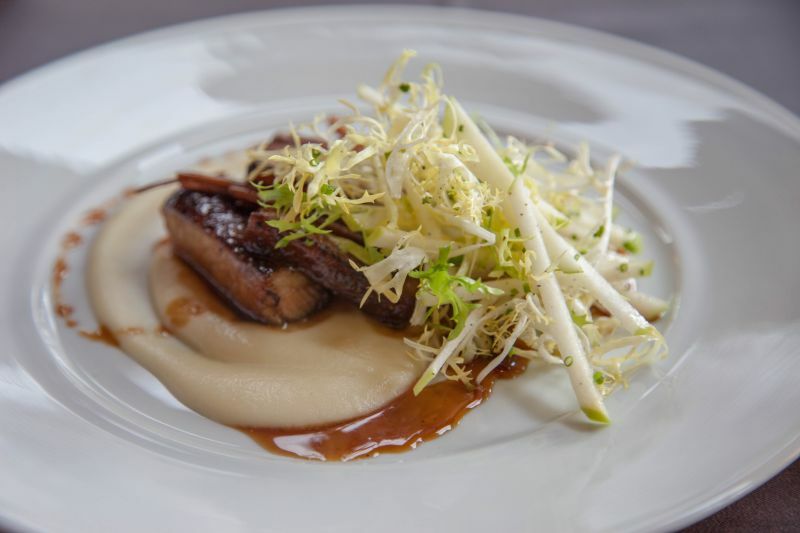 We decided on the glazed pork belly with apple puree, burdock, and soy caramel. The dish was beautifully presented. Gorgeous slices of pork belly graced the plate. The glaze reminded me of Chinese hoisin sauce with that signature five-spice seasoning. The fat of the pork belly was browned without being crispy. The meat was tender, juicy, and flavorful. It was served on top of an apple puree which gave the flavor an extra dimension of deliciousness. It was served with a very simple salad of friseé and slim green apple matchsticks. The salad was dressed in a light olive oil and salt dressing with a hint of pepper. I can’t even tell you how great this combination was. I always have a hard time getting The Brit to eat anything that even remotely looks like a salad, and he gobbled this one up with glee. The Brit comments: This felt like a dish inspired by Peking crispy duck. It was an ideal starter to share. 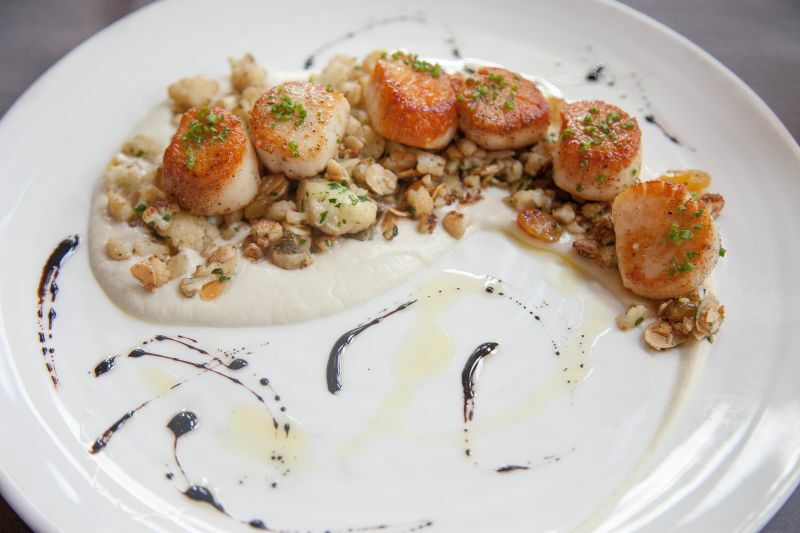 For our main courses, I decided nearly immediately on the caramelized diver scallops with cauliflower puree, almonds, and a balsamic reduction. That combination really leaped off the page at me. 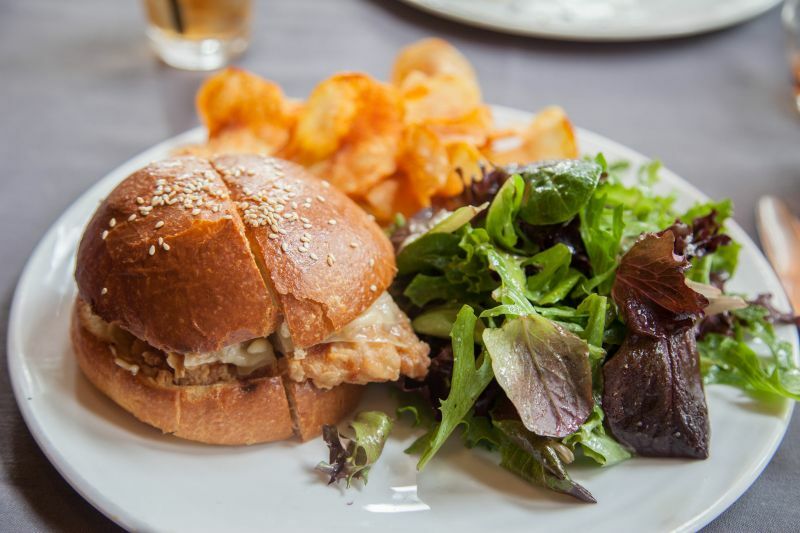 The Brit took more time in his selection and decided to go with the fried chicken sandwich without the cabbage slaw. Sometimes we try to order plain dishes like a burger because in our opinion it is important to order a variety of things for our readers and not just the fancy stuff. A good chef will make all the food with the same excellence and care. This chef sure did. Throughout the meal, our waiter was efficient and on point. He was so pleasant and checked on us often to make sure we had all we wanted and needed. When our food arrived I got really excited. My scallops looked perfect. The plating was very artistic and I loved how the chef used the balsamic reduction to make a beautiful pattern on the plate. It also left no empty spots visually and took the WOW factor up a few notches. Even more impressive were the flavors. Ok, so the scallops were cooked to perfection. That wasn’t what made it WOW. It was the combination of flavors. Not mentioned in the description was the addition of golden raisins to the plate. With the creaminess of the cauliflower puree, the lovely crunch of the almond slivers, the sweetness of the golden raisins, and finally the acidity and depth of the balsamic reduction I was in heaven. 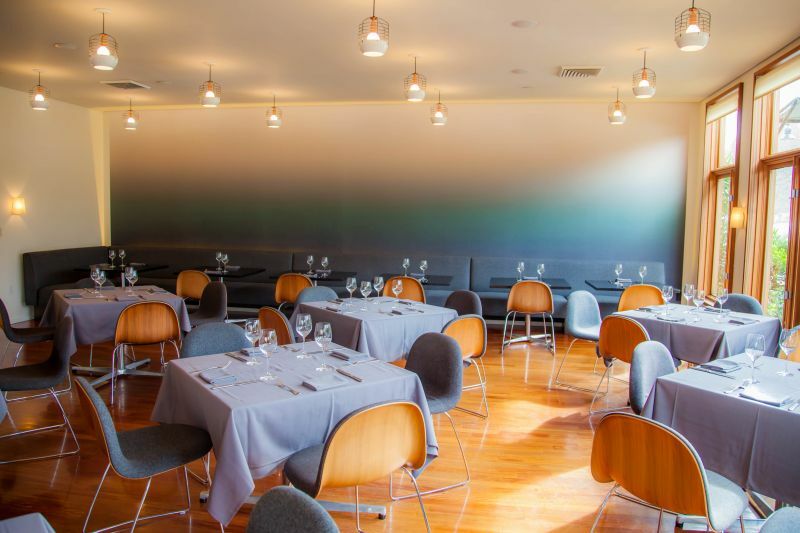 There wasn’t any note out-of-place; the textural differences in the elements were interesting and a joy to eat. This was a fantastic dish and I wish I had been creative enough to come up with it. The Brit’s Fried Chicken Sandwich was delicious too. It was a plentiful plate and I really liked that. It was exactly how it should be; big and hearty with a side of barbecue flavored potato chips and a nice looking salad made of arugula. The cook on the chicken was perfect (You all know how I hate overcooked dry chicken)! Tender and juicy; interesting textures and good flavor to the batter. I was disappointed not to have the coleslaw in my bite, but The Brit doesn’t enjoy coleslaw. Next time I’ll order it on the side! The Brit comments: There was nothing to criticise in this dish, but I was envious of the truly amazing food that California Girl had ordered. One item of note was that rather than a single slab of meat in the sandwich, the chicken was cut up into small pieces. The result was that the crunch of the coating was mixed throughout and not just around the edges. 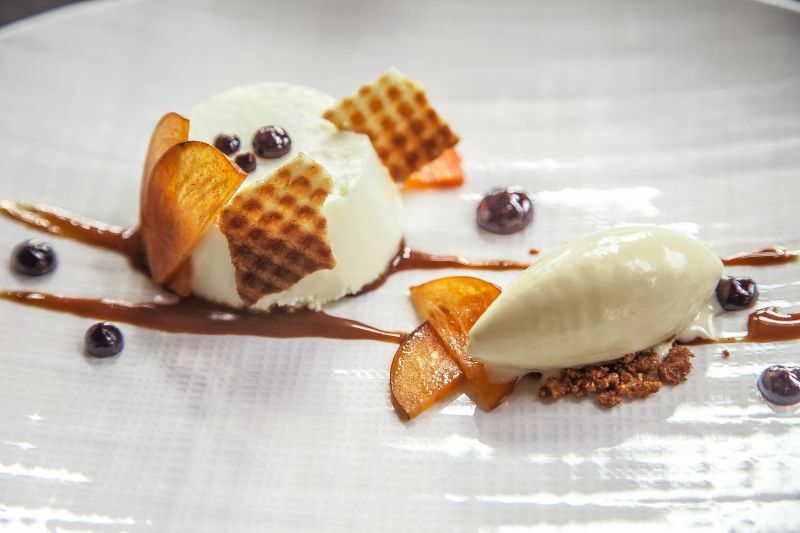 After deciding that we needed to linger over dessert, we finally agreed to share the sour cream cheesecake with the huckleberry and cassis gel and waffle cone ice cream. I don’t enjoy ice cream in general, so I am going to skip over talking about that portion of the dish and allow The Brit to talk about that. The sour cream cheesecake was amazing. So much flavor in each bite. I loved the huckleberry and cassis combination. It was delicious. The Brit comments: The ice-cream was creamy and with a sweetness that balanced the delightful sharpness of the cheesecake. I can’t say enough good things about our meal. I was even more impressed with the price of our meal. It was around $80 for the two of us to eat, which included an appetizer, two entrees, two iced teas, and a dessert. It wasn’t an inexpensive meal, but well worth the price for the quality of the food. 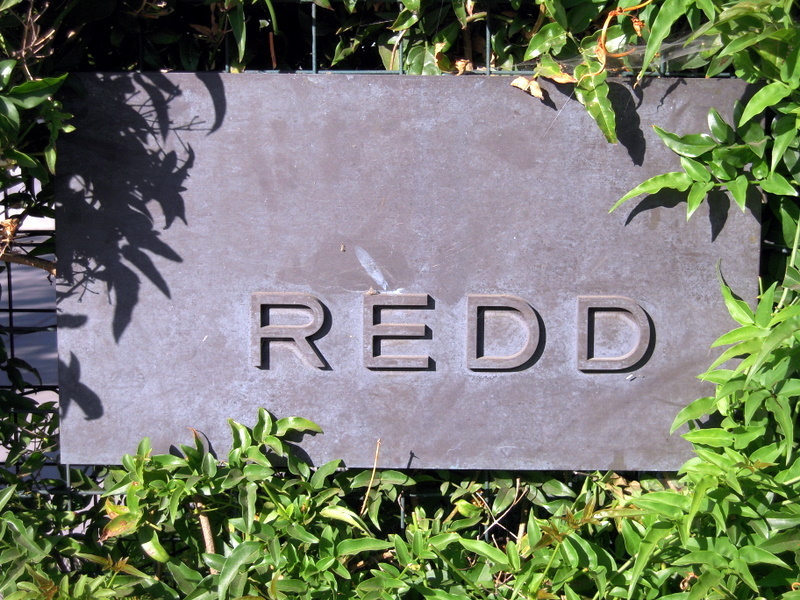 We would highly recommend you place Redd on your list of restaurants to visit in Yountville.